A treat for all you Trick-Or-Treaters, here's a FREE download (or treat) of one of my tracks. The FREE MP3 download today is "I Seen It!" 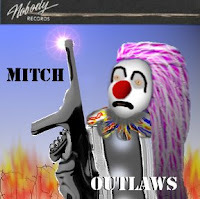 (click here to download)(link disabled), taken from MITCH's Outlaws CD. This song was recorded when I lived in Oakland, CA at the original Pumpkinland Studios. This song probably should have made it onto SS-MOPEHEAD, but due to the rock nature of the track it made it onto Outlaws instead. Not sure how much of a Halloween track this is...so you decide. Enjoy the FREE track and please drop me a comment. Remember, all of my CDs are available for purchase at HauntedCDs.com.Be sure and support Halloween Radio by purchasing CDs from us!